This is a very interesting beer for two reasons. First the reason it was brewed and named Lindz is in memory of Lindsey Altshul who was a big supporter of craft beer and co-owner of Pepperland Cafe in South Berwick. He passed away in the Summer of 2012 and Smuttynose decided to make a beer in his memory. Second it is a Kolsch style beer which is fairly uncommon in today’s marketplace. A Kolsch beer is an ale but is it cold conditioned like a lager. Appearance is light and very clean with a thin white head. The aroma and taste are very similar and both quite mild. Slightly sweet smell with some earthy hops, tastes adds another layer with a fair amount of bitterness. Lindz has a bit more carbonation than I am used to but apparently that is normal for the style. Overall this beer was pleasant, easy to drink and tasty even though the flavors were all quite subtle. A nice beer with a great story behind it. 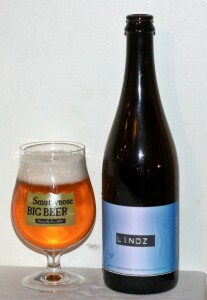 See the link below to Smuttynose’s blog post about Lindz.